Play with your kids in the pool in between trips to the theme parks. Relax on the porch swing or take out a paddle boat. Cypress Harbour brings the sandy beach to you. Order a drink after a long day at the parks. Your kids will love the fun games at the resort's arcade. These freshly appointed condos are decked out with spacious living areas. Kids will love the outdoor play area, mini golf course, and fun lake activities. You're a quick drive to the 18-hole Hawk's Landing Golf Course. Enjoy a refreshing drink at Pavilion Bar & Grill, as you lounge by the pool. Every residence has its own personal balcony. Take your first cup of coffee outside in the fresh morning air. All condos have whirlpool tubs for long, luxurious soaks - it's like a mini spa right in your suite. 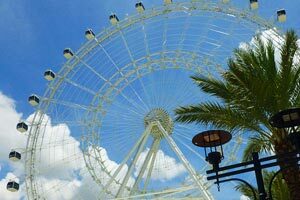 Marriott's Cypress Harbour is conveniently located in Orlando, near the area’s best theme parks. After dropping off your luggage in your condo, get changed into swimsuits, grab pool toys and water wings and apply sunscreen. The resort has three outdoor pools, try them all before deciding on a favorite. Get in a workout at the fitness center or treat yourself to a massage, facial or body wrap at the Cypress Spa while the little ones are participating in the scheduled kid's activities or the arcade. A post-spa visit to the sauna is a must. Meet up with the family for a game of 9-hole mini golf, volleyball, basketball or tennis. Two-bedroom condos sleep eight guests and have enough space for all of the kids along with their toys, blankets and games. Full kitchens allow you to save money by making your own meals. Bring the kids along to the on-site Marketplace or to Publix to stock up on groceries. Don’t feel like cooking? No problem, there’s an on-site American Restaurant and a Pizza Hut Express. The pizza hut will even deliver to your condo. While you’re enjoying your pizza, watch a movie on your Flatscreen TV. It has the premium cable channels HBO, CNN and ESPN. Browse the resort’s selection of DVDs for rent or bring some of your favorite movies from home to watch on the DVD player. Don’t worry if the kids got pizza sauce on their clothes; there’s an in-suite washer/dryer. Enjoy a relaxing soak in your jetted tub before bed. You deserve it. Marriott’s Cypress Harbour is just a few minutes away from Discovery Cove. It’s an all-inclusive day resort that features a variety of animal encounters including bottlenose dolphins, tropical birds, otters, tropical fish and rays. SeaWorld® is home to Mako, Orlando’s tallest, fastest and longest rollercoaster. Kids will love Shamu’s Happy Harbor, Jazzy Jellies and the Sea Carousel. Animal shows with dolphins, sea lions and orca whales are always a big hit. Universal Orlando® has several rides based on hit movies. Fast & Furious - Supercharged, Revenge of the Mummy and Men in Black Alien Attack are in Universal Studios®. Catch The Blues Brothers Show, Fear Factor Live or Universal’s Cinematic Spectacular. The Wizarding World of Harry Potter® - Diagon Alley is where you will find Ollivanders Wand Shop. Witness a wand choosing ceremony, see the Knight Bus or watch The Tales of Beedle the Bard Trunk Show. With a park-to-park ticket, you can climb aboard the Hogwarts Express to The Wizarding World of Harry Potter® - Hogsmeade, located in Universal’s Islands of Adventure®. Dervish and Banges has all things Quidditch. See a performance from the Frog Choir, watch a Triwizard Spirit Rally or ride Harry Potter and the Forbidden Journey. Universal’s Islands of Adventure® is also where you will find the Jurassic Park River Adventure®, Doctor Doom’s Fearful® and The Incredible Hulk Coaster. Walt Disney World’s® most classic attractions It’s a Small World®, Haunted Mansion® and Dumbo the Flying Elephant® (and many more!) are at Magic Kingdom®.